Legendary Philippine priest Fr. Corsie Legaspi will be visiting Pattaya once again on October 8 to perform his ‘Divine Healing’ on the sick and suffering. Fr. Corsie is scheduled to arrive at the Assumption Church (near the Siam Country Club) at 1 p.m. to lead a holy mass, following which films will be shown about his healing sessions and success stories. He then will start healing those who are suffering illnesses and crippling pain by merely placing his hand on their forehead. Many of the people who go to see Fr. Corsie pass out during this ‘healing’ process and are caught by helpers who lay them down gently on the floor where they will rest for a while. Fr. 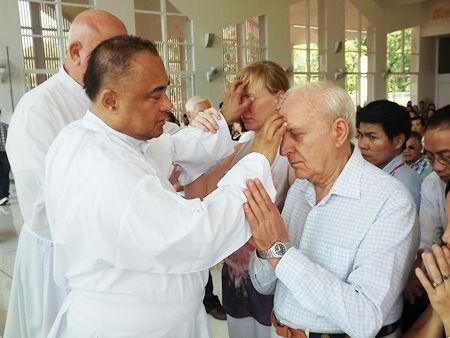 Legaspi wants to stress that it is not him who performs the healing miracles – it is God’s divine power channeling through the priest. Fr. Corsie Legaspi lays his hands on the forehead of those who seek help. Anyone who is suffering from some ailment, no matter what their religious affiliation is invited to attend the session. There is no entrance fee and the healing sessions are also totally free.